Cast iron cookware is risky for people suffering oxidative stress. Think Alzheimer's, autism, CP, Parkinson's, these diseases, etc. In the July 1986 issue of the Journal of the American Dietetic Association researchers found that cast iron contributes high levels of iron to foods. 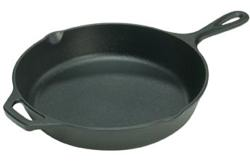 Cast iron, including "heirloom" cast iron that people tend to think of as "totally safe", normally contains small quantities of other metals such as aluminum, antimony, arsenic, bismuth, lead, nickel, tin, and tungsten. The percentages are quite small — typically 0.005% to 0.5% for a specific metal. The actual amount ingested still adds up. A typical 12-inch cast iron cooking skillet weighs ~ 8 lbs which equals 3.6 kg. The skillet can impart 10 mg of iron to food daily for 5000 years (ignoring rust as the ages go by). Arsenic, with a normal level of 0.05%, comes in at 5 µg daily. The FDA does not specify any allowable level of arsenic in food. Internationally, a widely accepted maximum allowable daily limit (MADL) for arsenic ingestion is 220 µg/kg (0.22 mg/kg). The average 10-year old girl weighs 33 kg (73 lb). Exposure to 5 µg arsenic from the skillet is 0.07% of that daily limit. The same math applies to the other toxic metals in the cast iron. This kind of low level of exposure may not be a problem for an adult with a strong ability to detoxify, but for a child with impaired metal excretion it should make you stop and think. These metals will be consumed on a regular basis and combined with other sources of exposure. Their synergistic impact may not be trivial, especially as the metals accumulate. The right amount of iron is necessary for optimal health. Iron is provided by various foods and also through environmental exposures. However, it is possible to have too much iron. When excess iron is the primary cause of organ failure (usually after years of gradual degeneration) it is called hemochromatosis. Hemochromatosis has been linked to the list of neurological diseases now generally associated with heavy metal toxicity. Research demonstrates that iron (Fe) causes high oxidation and free-radicals. A chemically inert cooking surface such as ceramic or enamel would be less toxic for vulnerable individuals. Other individuals probably don't need to worry — enjoy your heirloom cast iron cookware!